Auto Layout in interface builder, can be a frustrating experience for those who do not know how to use it. Once you understand how to use Auto Layout, it becomes part of a simple workflow. However, there are times you code a button or label instead of using Interface Builder. For those cases you need to code your constraints too. Constraints in code, is an incredibly powerful way of laying out UIViews into a useful interface. This lesson will introduce the steps in Swift to programmatically add UIView and its subclasses to an already existent view, then how to place them using Auto Layout. // How to set the orientation. This is the override to use all orientations. There’s a lot going on here in line 3. Unlike Objective-C there are no factory constants, only structs. If you look for the constant UIInterfaceOrientationMaskAll in the auto suggest, you will not find it. You will find UIInterfaceOrientationMask instead and then need to use dot notation to get the All or other possibilities. We’ll see more examples of this later. We set a background color and call the method where we will do most of our work. Since we set up that method, you can add it near the top of the ViewController class. The code for these two is similar. In line 2 and 7, we instantiate a view. Line 3 and 8 is critical if you are using Auto Layout. It shuts down the auto resizing mask, which is an automatic way for Xcode to calculate constraints. Xcode has a very bad habit of making far too many constraints, and will cause a run-time error claiming you have too many constraints if you set any constraint programmatically. Set this to false and give yourself total control of the constraints. In the last line of both views, we set a color for the view. I tend to keep my adding of sub views together as much as possible, so I can control and document the stacking order. With that, we have two views. 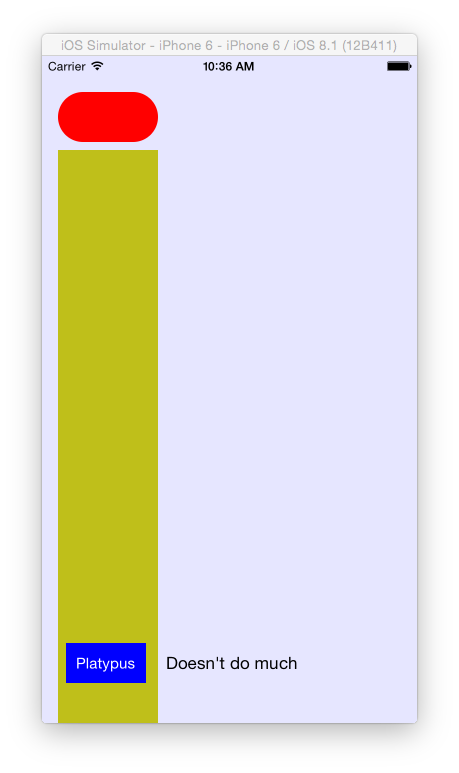 Line 3 and 4 use the constraintsWithVisualFormat class method to make horizontal and vertical sizing constraints — the height and width. The two lines are very similar in code except for the first parameter, which is the visual format string. Visual Format Language is a way to describe how to set up the constraints using keyboard characters. A keyword surrounded by square brackets  is a view. After the name, in parentheses () is the size of the view. The first two characters are either H: or V: standing for horizontal or vertical . Horizontal is the default and can be left off, but for code readability, I tend to add it. In our example "H:[view1(50)]" means we want a 50 point wide view and "V:[view1(50)]" means we want a 50 point high view. We have to send the options: a value from the struct NSLayoutFormatOptions. However None is missing or left out of the possible choices. The NSLayoutFormatOptions does have an initializer which takes a value using rawValue. By setting the initializer to rawValue:0, we tell teh compiler we are doing nothing here. The parameter metrics: we will discuss shortly, but for now leave it nil. Our last parameter is our view dictionary, which allows the method to know which views we are referring to in . Build and run this code. You’ll get a single red square in the upper left of the screen. This is the same as the code for the first view, with one exception. 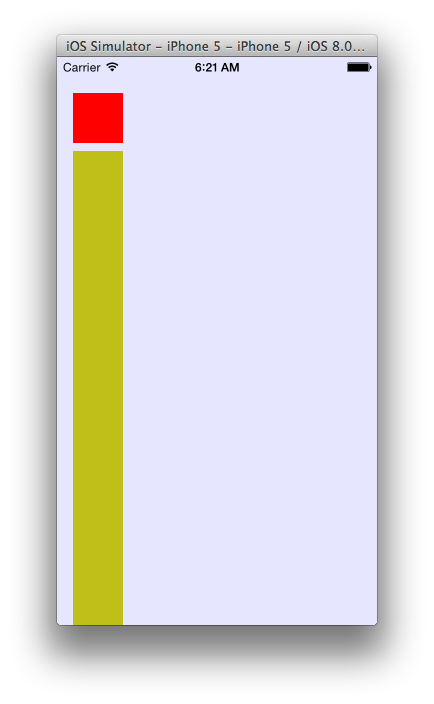 The format string in line 3 is "V:[view2(<=40)]". We have a height of 40 pixels. We also have a <= stating it can be 40 points or bigger, should the constraints call for it. When we place view2 we’ll place it to extend all the way to the bottom of the super view. By writing it this way, it does not matter what device or orientation we are on. Auto Layout will figure out how high to make view2. As in our size constraints, we use the same method constraintsWithVisualFormat(). We have two different format strings and the options in line 5 is now NSLayoutFormatOptions.AlignAllLeading. We add these constraints to view, not view1 and view2 for positioning constraints. We add to the closest parent of the views. Line 2’s format string "H:|-[view2]" is a horizontal string that sets view2 a standard width away from the left edge of the superview. The | is the edge of the superview, the - means a standard width between the superview and view2. Line 3’s format string is "V:|-36-[view1]-8-[view2]-0-|". In a vertical string, the beginning of the string is the top and the end is the bottom. While in line three we did not specify the right, here we specify top and bottom. The -36- and -0- are the same as - in line 2, but specify how many points apart the view and super view are. The -8- staes the views should be 8 points away from each other. So if we were to read this in plain language we have view1 36 points below the top of the superview, 8 points between view1 and view2 and no space between view2 and the bottom. Since view2 can stretch in height, this will turn view2 into a stripe down the entire view. Looking at the code, we did not specify a horizontal position in the visual language for view1. We used an alignment to do this. 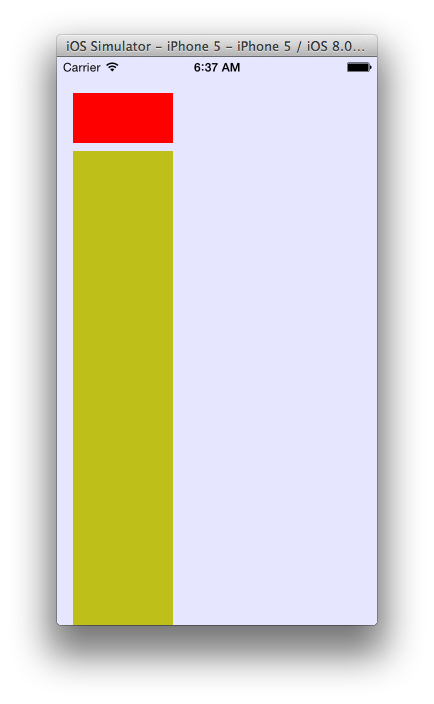 The constant NSLayoutFormatOptions.AlignAllLeading in the options: parameter of line 5 does this, aligning the two views on their leading side. Build and run. we now have a square and a stripe. 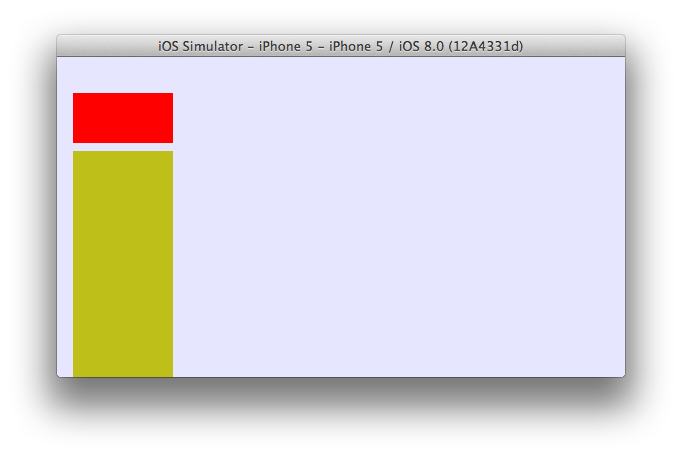 Rotate the device in the simulator with command and right or left arrow, and you have a shorter stripe. Build and run, and you will see no change. Change in the metrics dictionary "viewWidth":50.0 to "viewWidth":100.0 . Build and run again and we get a wider stripe. Like anywhere else we use variables or constants instead of literals, this make changes to code a lot easier. For clarity in the rest of our examples I’ll use literals, but be aware using metrics is a good practice to get into. let atRest = "Doesn't do much"
let atWork = "Secret Agent"
We declared two strings we’ll use in the target action for the button we’ll set up in a bit, a button and a label. We made a button and a label. Their scope is for the entire subclass, not just the methods like we did with the views. Declaring the label in Swift is just like declaring any other class: call its initializer, in this case UILabel(). 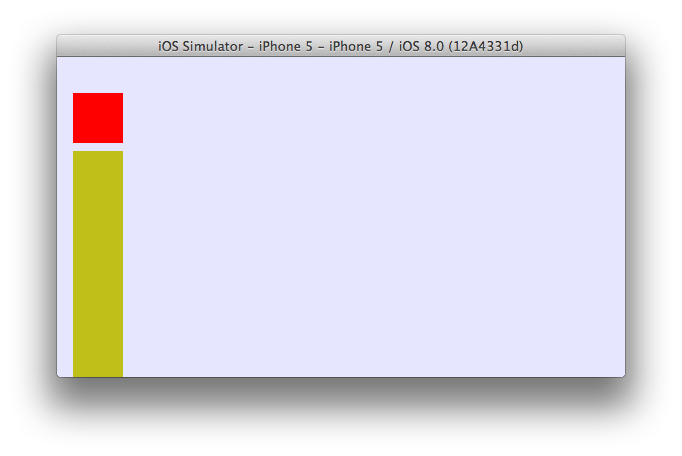 For the button we have a initializer method UIButton(type:) which takes a constant from the struct UIButtonType. Most buttons will be UIButtonType.System. Instead of making separate sizing constraints, we joined them into the positioning constraints. We already have an example of vertical alignment, so here is an example of horizontal alignment. Our visual format strings are "H:|-[button1(>=80)]-20-[label1(>=100)]" and "V:[button1(40)]-40-|" with options: set to NSLayoutFormatOptions.AlignAllCenterY in line 2. Line 3 vertically lays out button1 40 points from the bottom of the superview with a height of 40. Line 2 places button1the standard distance from the left of the superview, then places label1 20 points to the right of that, and aligns both vertically to their centers. Line 2 also makes the button at least 80 points wide and the label at least 100 points wide. Build and run. You will get a run-time error. button1 is not a key in the views dictionary. The dictionary has no elements for button1 and label1. Change the dictionary to this. SwiftAutoLayout[1874:60997] Unable to simultaneously satisfy constraints. Probably at least one of the constraints in the following list is one you don't want. Try this: (1) look at each constraint and try to figure out which you don't expect; (2) find the code that added the unwanted constraint or constraints and fix it. This error message is for too many constraints on a view. If we align center label1 as we did above then set a vertical constraint that it is 10 points from the top of the superview, we have conflicting information. This error tells us we have constraint conflicts. Our format is correct in this case — or so it seems. If we don’t send the message setTranslatesAutoresizingMaskIntoConstraints(false) to view2 Auto Layout will create constraints for us. When we add our own they will always be too many. As I mentioned above always make setTranslatesAutoresizingMaskIntoConstraints() false when you are working programmatically with constraints. Uncomment the line again ad the app works perfectly. That is the basics of setting up Auto Layout constraints in Swift. There is a lot more here to cover, but this is enough to get a developer busy working without a storyboard. The code is a single file this time. Here is all of it in working order. //  Created by Steven Lipton on 9/15/15. //  Copyright © 2015 MakeAppPie.Com. All rights reserved. Awesome tutorial! I would love to see more tutorials on building iOS apps completely programmatically in Swift!. It seems that a lot of serious developers dislike using Storyboards, so it would definitely be appreciated since almost every other Swift tutorial I’ve seen so far uses Storyboards. Thanks again – this was really helpful. I’ll be doing a few more like this, because it is the only way I can stand autolayout. Definitely one on Split View programmatically will be coming up this month or next month since it seems it is the only way in Swift to get it to work nicely without a lot of messing with optional values. I’m also going to do one or two Swift versions of my earlier Objective-C posts Life Without Storyboards about using Sprite Kit for more than just games – though a different application. Thanks for posting this. If you are trying to do anything complicated, story boards don’t hold up well. Looking forward to your split view tutorial. I got modals popovers and xibs stuff too. Just keep reading. I am trying to add a constraint for a very simple purpose: Add a background image in an universal app. The same picture is used for iPhone, iPad, portrait or landscape mode. It seems working for iPad. but for iPhone, the image seems to be shrink. Do you have an idea what is wrong in which I done? Very good question. One of those headaches that keep me away from Auto Layout. I’m not sure myself without checking. I know I ran into that problem in one of the demo apps. Let me check on that and I’ll reply back to you shortly. You have to set the contentMode property of the imageview according to how you want it to display the image. Its default value is UIViewContentModeScaleToFil, but you usually want to set it UIViewContentModeCenter. I’m wanting to set the corner radius of the view, relative to the view width, but accessing view1.frame.width gives me a 0 – what am I missing? Autolayout happens after viewDidAppear. What that means is without using some methods that are a bit dangerous to use, you can’t get the width that way. There are methods on UIview that work with constraints, but i’ve never used them. This is one of those times where skipping autolayout might be prudent. If I want to set the view’s corner radius, based on the view width, I try retrieving view1.frame.width but get a 0 – what am I missing? 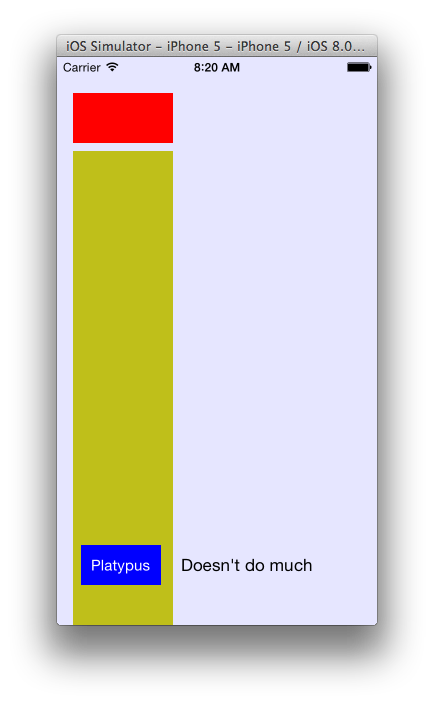 Thinking about it last night the whole issue of sizing with autolayout might make a good blog entry….Stay tuned. Can’t guarantee anything for a few weeks but I’ll look into it. zag’s solution didn’t work for me. Sorry for the delay in answering — I’m way behind in a bunch of projects. What was not working? Not a question from me. But, from zag about setting a corner radius based on a view’s width. It caught my interest, and he posted the answer to his own question. However, as it threw an error when I ran it, I wonder how it worked (assuming it did) for zag. I have gone gray, and then bald trying to fathom it. // Created by apple_2 on 19/12/2014. // Copyright (c) 2014 ugajin. All rights reserved. sorry. I’m on the road and cant look at anybody’s programs right now. Just wanted to say THANK YOU SO MUCH! I have been banging my head off the desk for a month trying to figure out how to auto layout working programatically in Swift and finally I have something that works. All I need now is to figure out how to get my iAd banner to disappear and reappear nicely. Thanks again! It is important that for sprite kit this is located as the last thing in viewDidLoad. Set up everything else first. If you don’t, then there will be a fatal error. This is due to iAd taking everything that is in the view and making it a subview. I have not yet learned how to use that subview, so for the moment at least all the ducks need to be set up before you call iad. Thanks for this excellent article. In the walkthrough, you skipped adding the Button and Label to the subView. The final code has it in the end, but it’s not shown anywhere else. Might trip up some beginners. thanks. I’ll take a look at it. When I set setTranslatesAutoresizingMaskIntoConstraints(false), no user interaction happens, even if I set userInteractionEnabled explicitly and programmatically add the event code. I am not using ANY constraints. Do you know what could be causing such a thing? If I set setTranslatesAutoresizingMaskIntoConstraints(true), all user interaction works great. There are always constraints, even if you are not using them. The system assigns them. That mask’s sole purple purpose is to make sure those constraints that you didn’t put a constraint on have one. When not using programmatic constraints, it’s best to leave the mask alone. As the author of the project, I realize that this is a bit of a shameless plug, but, like you, I prefer to build UIs programmatically but find working with constraints very cumbersome. One of the main reasons I created the project was to help simplify that task. I will be updating this myself shortly. Thanks for the heads up. I created an application to pure code other elements are resized as do tests on different simulators , but one element is not positioned automatically , how I add the appropriate constraints to be always positioned on the right bank of the devices and resize each type of resolution , obviously I can not add the constraints dynamically as everything was done with code , how it should do this but with code. Since there is no Autolayout in this code, I would not know where to begin. Here is what I suggest: understand Autolayout on the storyboard first, then re-read this section. if you look at my Autolayout posts or buy the Practical Autolayout book you should have an good understanding to solve your problem yourself. This tutorial is an excellent introduction to using AutoLayout programmatically. It helped me out a lot with a project I’m finishing up. While I think I’ll likely end up using SnapKit or Neon in the future it’s good to what code those libraries are abstracting. What’s the best method to show content like Facebook News Feed? There are a lot Custom Cell types with similar item like avatar, title in top; Like, Comment, Share buttons in bottom. But they have different Main Content, example: Photo feed is different with Note feed. I don’t think they will create a custom Cell for each different Feed type, because if they want to add more line (example comment number), they have to change all layout and code for all custom Cell. Good question. Haven’t done it myself, but most likely They use custom cells but dynamically assign them in the tableview:cellForRowAtIndexPath: data source of the table view. 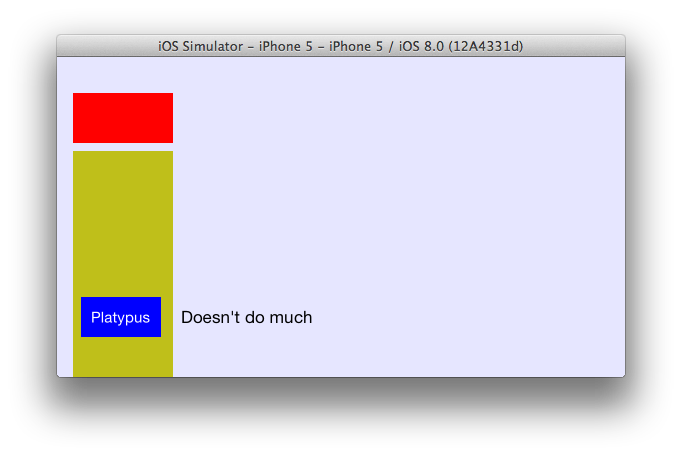 The custom cells are set up with auto layout and a few of the UITableViewDelegates to size everything dynamically. I haven’t written a post on custom cells or dynamically using them. I’ll have to do that soon. Thank you for your reply. I can’t wait to see your new tutorial about custom cell. Actually, the real question for my issue is how to initialize custom UIView from nib file with auto layout and insert it to custom UITableViewCell. I posted my code and project in stackoverflow but didn’t see any helps. Can you go through it and give me some ideas to resolve it? Thank you very much again. The article only describes a single custom layout, but you could easily create a single cell type that uses multiple layouts, each of which would be defined in their own layout document. I think MarkupKit is very great. Hope that I can use it in next project. Thank you very much. MarkupKit’s LMRowView and LMColumnView classes can be used to create complex layouts. They are similar to the new UIStackView class, but they have a couple features that UIStackView doesn’t have, such as the ability to set a background color and weight-based distribution. They also work in iOS 8 (UIStackView requires iOS 9). All three classes (LMRowView, LMColumnView, and UIStackView) allow you to dynamically update their contents at runtime using the addArrangedSubview: and removeArrangedSubview: methods. I’ll take a look at your SO post and see if I can offer any suggestions there. THIS IS AWESOME!!! There’s no diagrams of how these things all work together, and Xcode’s Storyboards are than Adobe Illustrator in terms of arcane and nonsensical UI/UX. So I’m left with only the aid of brilliant breakdowns like this to see how things actually work. Unfortunately, with the constant changes in Swift, the codes are a bit out-of-date. in Xcode 8.3.2 Swift 3. The complete code comes up with a lot of warnings and errors. It gives me a warning but I am not sure how to fix it. Next PostNext The Swift Swift Tutorial: Ten Points for Using Optionals.